Ice applied to a sore ankle or overused muscles reduces swelling and helps minimize pain, so it makes sense that whole-body cryotherapy induces this pain-relieving effect all over. The integrative health care team at Denver Sports Recovery, in Denver, Colorado, often recommends cryotherapy for those looking to recover after a sports injury, reduce chronic pain and inflammation, and boost overall health and wellness. Find out if cryotherapy can help you get relief from a variety of health concerns. Call to schedule an appointment or book online. Cryotherapy means “cold therapy,” and it’s a technique in which you submerge your body into a chamber under an extremely cold temperature for several minutes at a time. Whole-body cryotherapy (WBC) at Denver Sports Recovery involves exposing your body to -226°F for less than three minutes. Your brain thinks you’re freezing, so it sends out anti-inflammatory signals and releases natural pain relievers. As a result, you get a burst of energy, a flush of metabolic waste from your system, and relief from aches and pains. Each cryotherapy treatment helps to rebuild your body and the positive effects of spending just a few minutes in a freezing temperature lasts up to 6-8 hours afterward. Am I a good candidate for cryotherapy? 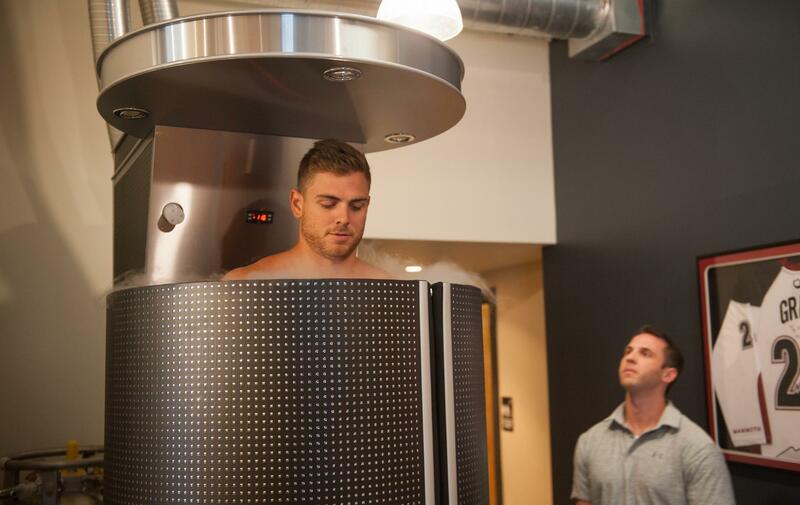 Cryotherapy can be a beneficial part of any fitness and health plan, whether you’re a professional athlete, weekend warrior, or someone who simply wants to optimize overall wellness. Generally, if you’re in good overall health and you don’t have high blood pressure, heart disease, or poor circulation, you’re an ideal candidate for WBC sessions. When you have a sports injury, chronic joint pain, or another health issue you’d like to remedy, the team at Denver Sports Recovery has you covered. Your specialist creates a comprehensive treatment plan based on your individual needs and conditions, and cryotherapy may be part of that recommendation. To learn more about this innovative therapy that works with your body’s natural response to reduce pain, call the office or use the convenient online booking system to schedule an appointment.